Michael Vick has been signed to a two year contract with the Philadelphia Eagles. My view: He's done his time, he's entitled to re-enter society and get back to work. Football is a sport, it's not a job that requires some greater degree of purity than any other job. Under the reinstatement plan, Vick can participate in preseason practices, workouts, meetings, and play in the Eagles' final two exhibition games. He could receive full reinstatement at any point, but Goodell said he would grant that by the weekend of Oct. 18-19 at the latest, provided Vick lives up to his end of the agreement. According to Fox's Jay Glazer, Vick signed a one-year, $1.6-million contract with a team option for 2010. The option is for $5.2 million. NFL quarterback Michael Vick, serving his 23 month federal sentence for dog-fighting (background here), pleaded guilty to a similar charge in state court today. He received a suspended sentence, which now makes him eligible for a half-way house on the federal sentence. Vick was taken to Virginia last Thursday after (Judge)Campbell rejected a request by Vicks' attorneys for him to plead guilty by videoconference. From Kansas where Vick is serving his federal sentence to Virginia on "Con Air" usually requires an unpleasant stay at "the hub" prison in Reno, OK. Inmates are mostly in lockdown and encounter all sorts of unpleasant people along the way. (I'll spare you the stories I've heard about Reno over the years.) Same thing for the return. It's not likely to be a direct flight but another trip to Reno first. So unless Vick is receiving special transfer treatment, he has received an extra punishment for his state plea. Michael Vick has been transferred to the federal prison camp at Leavenworth, KS to enable him to participate in a drug treatment program which could knock a year off his 23 month sentence. The Bureau of Prisons Residential Drug Abuse Program is a program available to all qualifying federal inmates with a drug problem. An inmate must meet the following eligibility criteria to be admitted into RDAP: (1) sentenced to BOP custody, (2) determined by the BOP to have a substance abuse disorder, (3) sign BOP's "Agreement to Participate in the Bureau's Residential Drug Abuse Program," (4) reside in a BOP institution, (5) serving a sentence with enough time to fully participate in a residential drug abuse program, and (6) willing to participate in a residential drug abuse treatment program. Upon successful completion of RDAP, an inmate can receive a sentence reduction of up to 12 months, limited financial rewards, and additional privileges within the institution. If inmates fail to complete the program, they are ineligible to receive these incentives. Inmates are ineligible for the sentence reduction if their current or past criminal history includes a serious violent offense. It's not only available at Leavenworth. In 2005, 18,027 male and female inmates participated in BOP’s residential drug abuse treatment programs. We need more federal prisons to offer these programs, not outrage that Vick was allowed to participate in one. 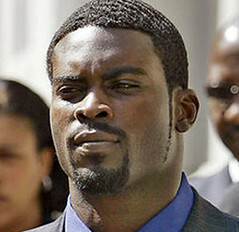 I wonder if Michael Vick is sorry now that he surrendered on Thanksgiving weekend to start serving his sentence. It doesn't seem like it made a bit of difference. A federal judge today sentenced Vick to 23 months in prison. Even though Vick pleaded guilty and surrendered early to begin serving his sentence, and the plea agreement (pdf) contemplated a two point "acceptance of responsibility" reduction, the Judge didn't give it to him. Nor does it seem he got a cooperation reduction which the Government said it might request if he provided helpful and truthful information. The Plea Agreeement also said the prosecutor would ask for a sentence at the low end of the applicable guideline range, but the AP says it asked for a sentence at the high end. Sounds like Government doesn't think Vick held up his end of the bargain. Michael Vick doesn't face sentencing for his dog-fighting case until December 10. But he decided to start serving the sentence today. I'm not getting this. Why would he want to serve three weeks in a county jail instead of a federal prison camp? Why does he want to spend Thanksgiving and Christmas in prison? He would likely have gotten a voluntary surrender to the designated institution on December 10, putting the start of his sentence off until January. I don't think it will have a major impact on the sentencing judge, and he's still facing state felony charges. Maybe he's feeling like he's just wasting time while waiting and would rather get out sooner, even if just by three weeks. Or could the reason be financial...to make it harder for him to be personally served with lawsuits? Financial troubles have further sullied Vick's image: He's being sued for more than $4 million by banks claiming he defaulted on loans and might have to repay nearly $20 million in NFL signing bonus money. Live Update: Michael Vick Statement. For most of his life he's been a football player, not a public speaker. He wants to speak from the heart. He wants to apologize for all the things he's done and allowed to happen. Apologizes to the Commissioner and other team people. He was not honest in his previous statements to them. He was ashamed and disappointed in himself. He apologizes to young kids out there for his immature acts. What he did was very immature, he needs to grow up. Asks for forgiveness and understanding as he moves forward to better Michael Vick the person, not the football player. He was irresponsible and those things didn't need to happen. He blames no one else. He had bad judgment and made bad decisions. Dog fighting is a terrible thing. Through this situation he has found Jesus and has asked for his forgiveness.